Foot orthotics allow the muscles, tendons and bones of the feet and lower legs to function at their highest potential. 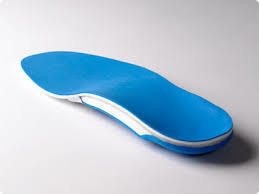 Orthotics can decrease pain, not only in the foot, but in other parts of the body such as the knee, hip and lower back. They can also increase stability in an unstable joint, prevent a deformed foot from developing additional problems, and improve overall quality of life. 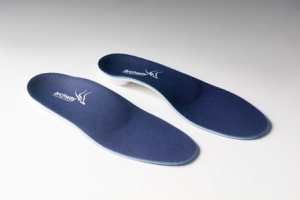 Orthotics are temporary or customised orthopaedic insoles that fit easily and securely within your footwear. They are designed to fit your feet more efficiently than over-the-counter arch supports and balance the biomechanical inadequacies of your feet and legs, which allows you to get on with daily living pain free and improve your sporting achievements. Temporary Insoles enable the patient to experience the benefit of an insole instantly, while a permanent orthotic is being designed. They can also be beneficial for anyone who just requires some short-term relief. A full biomechanical and gait analysis will be carried out. History and physical exam of your feet. From this information we will have a clear picture of what orthotic will be needed. A cast of your feet will be taken, which is pain free. We will then in return after a period of approximately a week have the new device, which is generally the length of your foot and of a plastic material. You will be asked to come back in to be fitted with your new orthotic. Plantar fasciitis causes pain under your heel. A unique combination of heal cup and metatarsal arch support the foot muscles, immediately eliminating the pain. Hallux valgus (bunion) (hammer toe) a bunion is a deformity of the base joint of the big toe. Our inner longitudinal arch support reaches under the 1st metatarsal, raising it to distribute bodyweight evenly. Ankle sprains are some of the most common sports injuries. In most cases the ankle is rolled outwards, resulting in damage to the lateral ligaments. This is known as an eversion sprain. We have effective treatments for both prevention and pain relief. Achillies Tendinitis – Controlling biomechanics allows all joints and muscles to function normally, thus eliminating the stress. Arch/heel pain (heel Spur) Our supporting heel cup “holds” the heel bone in a stable position where the spur cannot be agitated while walking. Leg/knee pain, excessive pronation or supination, inner and outer longitudunal arch and metatatarsal arch will correctly stabilize the foot into a neutral position. Hip or back pain – Planter Sciatic Nerve(Lower Back) A pronated heel entraps the sciatic nerve. Back pain can be lessened by stabilising the subtalar joint.